For example, the Regional Comprehensive Economic Partnership, which comprises ASEAN and its six free trade agreement partners, and the ASEAN-European Union Comprehensive Air Transport Agreement will involve significant trade-offs and compromises, he said. "But I hope governments will take a long-term approach, assess their enlightened self-interests, and make bold decisions which will improve our people's lives," he said, adding that this is what has brought ASEAN to where it is today. Tackling an often-cited criticism of the ASEAN decision-making process - which is built on consensus, PM Lee acknowledged it can be slow and unwieldy. But it has its merits, he said. "ASEAN, once it has arrived at a decision, does not change its position lightly. External partners therefore see value in deepening their engagement of the region through ASEAN." Singapore, which is chairing ASEAN this year, will initiate projects to strengthen the group's resilience against threats such as terrorism, cybercrime and climate change, said PM Lee. At the same time, it will help ASEAN economies to innovate and use technology. In a dialogue that followed, PM Lee was posed questions ranging from ASEAN relations with the major world powers to the impact of the Belt and Road Initiative. It was moderated by Ambassador-at-Large Tommy Koh. Professor Dewi Fortuna Anwar of the S. Rajaratnam School of International Studies asked how ASEAN can maintain its unity as various members desire to advance their relations with a growing China. PM Lee said there is a gradient among its countries in terms of their attitudes towards powerful nations like China, and they may differ in "where they line up" when issues such as the South China Sea dispute arise. But it is better to deal with these within the grouping, where the 10 members can strive to reach consensus, even though it may be a longer process than if the group had been smaller. I don't know that we read a credo every time we have lunch together, but I think that is the ethos of our meetings and that is the basis on which our officials cooperate. PRIME MINISTER LEE HSIEN LOONG, in a light-hearted response to a question on whether there is consensus among ASEAN leaders that the policy is to be close to all the major powers but not aligned with any. I don't understand, who is having a referendum? I don't think it is likely. Within ASEAN, we make decisions by consensus. It means you spend a long time reaching a consensus, you may have to put it off for the next meeting, or the next summit, or the future generation even, but it means that you will not be in a situation where you are compelled by the rules to agree to something because you have been overruled by the majority. And that is a survival value for us. PM LEE, responding in jest at first, on whether ASEAN may have to deal with a Brexit-type situation in its not-too-distant future, before explaining why the scenario is unlikely. China's influence is growing, how can the system of countries internationally accommodate this growing influence... Belt and Road is one way in which it can be accommodated constructively, peacefully, and win-win. PM LEE, on China's Belt and Road Initiative. 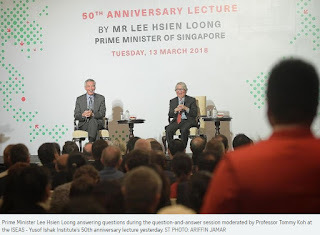 Think-tanks such as the ISEAS - Yusof Ishak Institute play an important role in helping Singapore maintain a "delicacy of perception" towards developments in the region, said Prime Minister Lee Hsien Loong yesterday. Using the late former deputy prime minister Goh Keng Swee's words, PM Lee said this deep understanding of regional affairs is needed not only among Cabinet ministers and government officials, but also among the intelligentsia, financial and business community, the media and other professionals. "ISEAS therefore continues to play an important role, enriching our collective knowledge of the region. I hope it will enhance mutual understanding among our ASEAN partners too," he said at the think-tank's 50th anniversary lecture. Tracing the history of the institution, which was first proposed by Dr Goh in 1966, a year after independence, PM Lee recounted how Singapore was then facing pressing economic and social issues. Yet, the founding fathers decided to invest resources in building a research institution to study South-east Asia. They did so because they "understood instinctively how closely our fate was intertwined with the region's", said PM Lee. South-east Asia then was a troubled region - for instance, Singapore had just separated from Malaysia, Konfrontasi was barely over and several countries faced communist insurgencies. To survive, a small and newly independent country needed to acquire a deep understanding of the region, said PM Lee. "Because small countries do not shape world events, events shape us," he said. Thus, Singapore had to acquire a "delicacy of perception" to foresee difficulties and opportunities, and prepare to address them. But this was lacking here. In a Cabinet paper proposing the setting up of ISEAS, Dr Goh noted that "we know more about Melbourne than we know Medan, more about the English Channel than the Sunda Strait", said PM Lee, drawing laughter from the audience. Dr Goh also believed an autonomous research institute would be better placed to develop such expertise as government officials would be too bogged down by day-to-day concerns to look at issues from a long-term, detached perspective. Thus ISEAS was formed in 1968, and has since established itself as a respected research institute on South-east Asian issues, having produced more than 2,000 books and journals, said PM Lee. He also paid tribute to ISEAS' longest-serving chairman, Professor Wang Gungwu, who has held the position since 1992, and its longest-serving director, Professor Kernial Singh Sandhu, who led the institute from 1972 to 1992. Prof Wang said in his opening remarks that it is certain that the next decade will bring momentous changes in the region, within and between neighbouring countries. "We also know that new trends such as anti-globalisation, nationalism as well as increased major power rivalry together may imperil our stability and economic success and undermine ASEAN's centrality as an organisation," he said, adding that the institute will study these changes and contribute to understanding these issues more deeply. A new exhibition on the history of ISEAS will be displayed at its library from today.